What kind of knowledge is medical knowledge? Can medicine be explained scientifically? Is disease a scientific concept, or do explanations of disease depend on values? What is "evidence-based" medicine? Are advances in neuroscience bringing us closer to a scientific understanding of the mind? • understanding the physician–patient relationship: the phenomenology of the medical encounter. • Models and theories in biology and medicine: what role do theories play in medicine? Are they similar to scientific theories? • Randomised controlled trials: can scientific experiments be replicated in clinical medicine? What are the philosophical criticisms levelled at RCTs? • The concept of evidence in medical research: what do we mean by "evidence-based medicine"? Should all medicine be based on evidence? • What do advances in neuroscience reveal about the relationship between mind and body? • Defining health and disease: are explanations of disease objective or do they depend on values? • Evolutionary medicine: what is the role of evolutionary biology in understanding medicine? Is it relevant? Extensive use of empirical examples and case studies are included throughout, including debates about smoking and cancer, the use of placebos in randomised controlled trials, controversies about PSA testing and research into the causes of HIV. 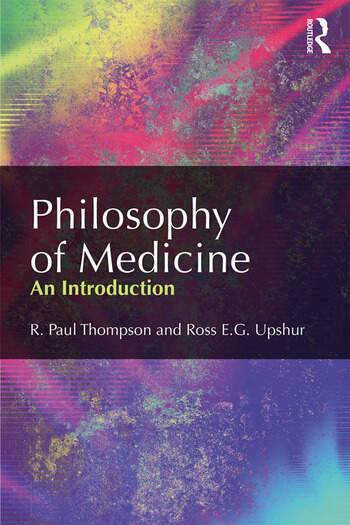 This is an indispensable introduction to those teaching philosophy of medicine and philosophy of science. R. Paul Thompson holds appointments as Professor in The Institute for the History and Philosophy of Science and Technology, the Department of Ecology and Evolutionary Biology, and the Department of Philosophy, University of Toronto, Canada. Ross E. G. Upshur is a physician, and Professor in the Department of Family and Community Medicine and Dalla Lana School of Public Health, University of Toronto, Cananda. He is also Head of the Division of Clinical Public Health, Dalla Lana School of Public Health, University of Toronto, Scientific Director, Bridgepoint Collaboratory for Research and Innovation and Assistant Director, Lunenfeld Tanenbaum Research Institute, Sinai Health Systems.